A landscape and marine artist, George Symons was one of America’s more noted plein-air painters who combined styles of impressionism and realism. His works are cited for their energy and simplicity, and he often did panoramic views. 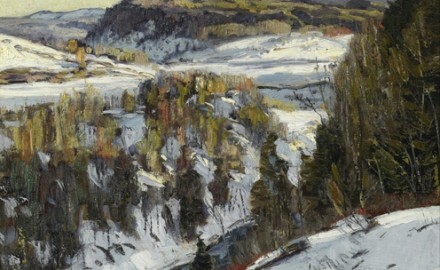 He painted entirely out-of-doors, frequently working in Arizona, doing desert landscape and the Grand Canyon views, which “were well received”, (Dawdy 424), but he is best known for his New England snow scenes, especially of the Berkshire Mountains. He died in Hillside, New Jersey in 1930.